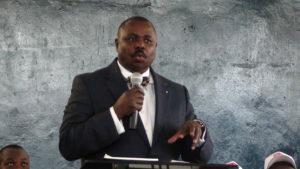 Deputy Speaker Jacob Oulanya addresses the congregation from the foundation’s Christian Community Church on Saturday. A large crowd of people estimated in their thousands on Saturday participated in a charity walk in memory of Irene Gleeson a grandmother who sacrificed her home in Australia to support children in Kitgum District at the peak of the LRA insurgency in 1991. Gleeson succumbed to cancer on July 21 2013 aged 67. Over Shs100 million was raised during the event to support the Irene Gleeson Foundation a charity which focuses on the plight of children in northern Uganda. The Foundation primarily depends on donor funding. First Lady and Minister of Education and Sports, Janet Kataha Museveni had been expected as chief walker but never made it. In a speech read for her by Deputy Speaker of Parliament Jacob Oulanya, she called for servant leadership with compassion and a heart to help the needy. She commended Mama Irene as she is fondly remembered for her compassion for the children of northern Uganda. “Gleeson’s fruit of compassion is all around us today. Out of a hopeless situation, we now have a community with flourishing hope because one believer was obedient to the call of God,” Janet Museveni said. 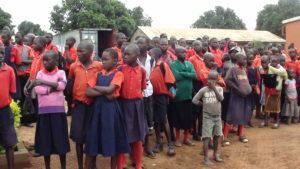 Some of the children supported by the Irene Gleeson Foundation. Courtesy photo. In 1989, Gleeson heard about orphans in Uganda needing help. She sold her beachside home and all her possessions to come to the aid of these children. She left Australia in December 1991 for Uganda and towed her caravan 500 kilometres from Kampala to the Sudan border. She arrived in Kitgum, 40 kilometres from the Sudan border and found the district had been ravaged by decades of war. The war was still ongoing, with Joseph Kony and his band of Lord’s Resistance Army rebels wreaking havoc; killing men in the villages and abducting children and forcing them to become child soldiers. It was a community of aged widows and orphaned children, trying to scratch for food from a harsh land. Oulanyah encouraged the people to emulate Gleeson, a mother who had compassion for children and cared for their wellbeing. John Kifasi, the executive director of Irene Gleeson Foundation, told our reporter that the Foundation has met the education and health service needs of over 20,000 children. It also continues to provide services to the local community through a technical institute, secondary school and child care centre, he said. “Mama Irene left a great task ahead of us and we have all these children to care for. Our prayer is that the local people support us in this cause,” Kifasi said. He said the Foundation hopes to fully stock a health ward to help mothers in the community and also decongest government health facilities in Kitgum. Bruce Mpamizo, the director sales and marketing at Movit Products Limited, revealed that his company contributed more than Shs45 million worth of goods to patients at Kitgum General Hospital, St. Joseph Hospital and Kitgum government prison, in memory of places visited by Gleeson during her mission in the District.